Witch Pumpkin? [C5196] - $10.96 : Yarn Tree, Your wholesale source for cross stitch supplies. 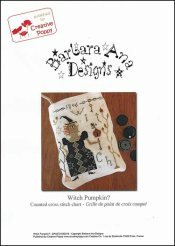 Shopping Cart Home :: Cross Stitch PATTERNS :: Barbara Ana Designs :: All Barbara Ana Patterns :: Witch Pumpkin? Cross stitch pattern from Barbara Ana Designs. With her red hair flying in the background, witches hat on & dress decorated with a quaker star pattern..this witch is looking into her garden for that perfect pumpkin for Halloween! Various plant motifs are stitched around her. "Witch pumpkin" do you think she will pick? Stitch count is 88 x 101.